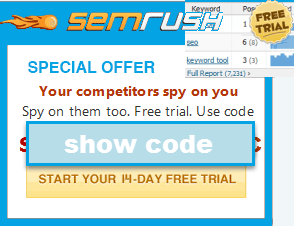 I have been a big promoter of the SEM Rush service because I think it rocks. As an extension of that, I partnered with with SEM Rush to license their data and offer the organic search piece of their service as a free bonus to our SEO training & community members. If you are a paying subscriber you may want to check out our new competitive research tool. The columns are sortable and it is easily to export 1,000 listings in a couple of seconds. On the competitive research tool page I list 10 high powered ways to use this tool. I would share them publicly, but if you only find one of those tips applicable to your site & situation you should still be able to make far more than $300 from it - making the cost of the subscription free. You register a subdomain about internet marketing on a free site that claims it offers the best internet marketing services (not even grasping the importance of owning your own domain name) and then promote it via comment spam. What are the odds that your page is actually worth reading?